Enzo Life Sciences is proud to introduce our newest immunoassay, IL-6 (human), high sensitivity ELISA kit, the most sensitive IL-6 ELISA on the market. Enzo’s new kit is able to detect IL-6 levels down to 0.057 pg/mL. In addition, our kit offers detection in 3 hours, with liquid color-coded reagents that reduce the possibility for error. From forty years of manufacturing, Enzo’s immunoassays offer high precision, accuracy, sensitivity, and specificity. IL-6 is a cytokine critical to the regulation of the immune and hematopoietic systems, usually expressed by T-cells, mast cells, monocytes, macrophages, fibroblasts, endothelial cells, keratinocytes, and many tumor cell lines. It plays a role in acute phase reactions and response to injury and inflammation. Human IL-6 also stimulates the differentiation of B-cells for antibody production, promotes expansion of activated T-cells, expands hematopoietic cell production, and induces the expression of acute phase proteins. 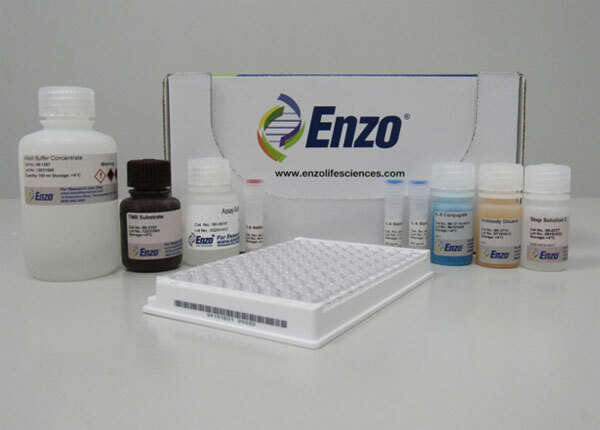 IL-6 (human), high sensitivity ELISA kit is the latest in Enzo’s line of cost-effective, highly adaptable, and high performance products and kits. This assay represents another addition to Enzo’s considerable portfolio of immunology products, including Cytokine and Eicosanoid ELISAs, CD Marker Antibodies, and Live Cell Analysis kits for Multidrug Resistance.